Haunted Ozarks by Janice Tremeear is a well-researched, finely written work full of interesting stories of haunted places, paranormal events, and actual history in and around the Ozark Mountains. Numerous references of mountain superstitions appear throughout adding to the ambiance of haunted folklore. The author makes the narrative of ghostly supernatural activity interesting without all the over-the-top hyperbole often found in books with similar subject matter. It was both entertaining and historically informative. 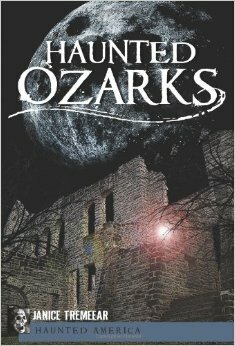 An enjoyable read I would recommend to anyone interested in the paranormal and/or history of the Ozarks. This entry was posted in Arkansas, Arkansas stories and folktales, Book Review, Books, Haunted places, Historic Arkansas, Ozark Mountain stories, Ozark Mountains and tagged ghost hunting, ghosts, haunted Ozarks, Janice Tremeear, paranormal. Bookmark the permalink.